After three incredibly successful days in Berlin, INTERGEO 2017 has drawn to a close. The trade fair and conference have been carried on the crest of the unstoppable wave that is digitalisation. Displaying a truly impressive spirit of innovation, INTERGEO confirmed its position as the world’s most important communications and networking forum for geo-IT. Berlin, 28 September 2017. “We are going to ride this wave. Stopping it is not an option.” That was the declaration made by Prof. Hansjörg Kutterer, President of INTERGEO’s host the DVW, when he spoke about the mammoth challenge that digitalisation poses for the entire geo-IT sector. He went on to emphasise that digitalisation has seen geodesists and geo-IT experts from a whole range of specialist backgrounds take on a very special role. Kutterer pointed out that geodata has long since moved from the fringes to the very heart of digital processes across all applications. A whole spread of new technologies, processes and approaches have emerged alongside “Geodesy 4.0”, which represents a forward-looking IT sector in the digitalisation age. He believes that “we are shaping digitalisation and bringing together different worlds in doing so.” In fact, that is becoming more important than ever, as digitalisation is no end in its own right. Solutions need to be found for social questions relating to mobility, energy, the environment, security and health and these issues cannot be tackled without digitalisation. The momentum that is driving digitalisation forward is constantly growing and INTERGEO reflects the current market dynamic, thus sending out a clear signal in this environment. After three days of showcasing products and solutions, disseminating information and promoting lively interaction at the conference and in forums, the event has drawn to a close with top marks. 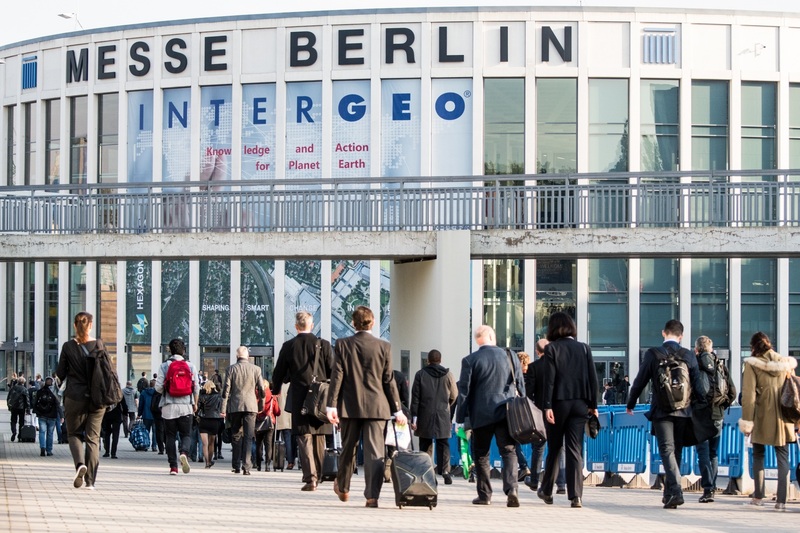 Some 580 exhibitors from 37 countries and more than 1,400 conference delegates can attest to the outstanding success, which has seen INTERGEO reaffirm its position as the leading international trade fair for geodesy, geoinformation and land management. Berlin also provided the bonus it promised as a major capital city – for the first time, the trade fair and conference attracted more than 18,000 visitors from over 100 countries. Digitalisation was also a recurrent theme at the conference and in the trade fair forums, too. Focal points of the wide-ranging programme of presentations and numerous interactive discussion formats included the digital city, Building Information Modelling (BIM), Geospatial 4.0 and Open Government. The three days at INTERGEO highlighted the breakneck pace of the digital transformation. Occupations themselves are changing, as the geodesists of yesterday become the geodata managers of tomorrow. There is an ever-increasing demand for “all-rounders” who can bring geodetic expertise, IT know-how and management skills to the table. This varied skill set will be essential for Building Information Modelling (BIM), the digital process applied to the planning, construction and operation of buildings and infrastructure. This particular hot topic played an even bigger role in INTERGEO, particularly because geodata lies at the very heart of this still relatively new method, which is designed to boost efficiency in the construction sector. A total of 158 exhibitors, 84 presentations in two forums and more than 30 take-offs and landings in Europe’s largest flight zone made interaerial SOLUTIONS at INTERGEO the meeting point for the international UAV sector. The enormous range on show underscored the event’s importance as Europe’s leading commercial and civil drone show. Presented for the first time this year, the DRONE PIONEER AWARD, which recognises sustainable solutions using drones, went to the ECOSwat project. This project documents climate change to provide conclusive evidence. A special prize sponsored by the Joschka Fischer Company was also presented to the ELEPHANT SURVIVAL ORGANISATION. Winner of the startup sessions was Project Airteam from Berlin, which offers drone services for a range of applications, including infrastructure inspection. As DVW President Professor Kutterer pointed out, it is still not possible to say how far digitalisation will take us. However, he stressed the importance of finding the right direction to ensure everyone is prepared for when the Internet of Things (IoT) and artificial intelligence methodologies bring added dimensions of digitalisation to the fore. “The overwhelmingly positive response from visitors to the trade fair and conference shows that we picked the right issues to focus on. We are evidently headed in the right direction,” said Kutterer. INTERGEO 2018 will explore that same direction in even greater depth and breadth. Digitalisation and the innovations it brings in terms of BIM, virtual and augmented reality, UAVs and smart cities will be at the top of the agenda from 16 to 18 October in Frankfurt.